2 Bedroom Flat For Sale in Glasgow for Offers Over £145,000. 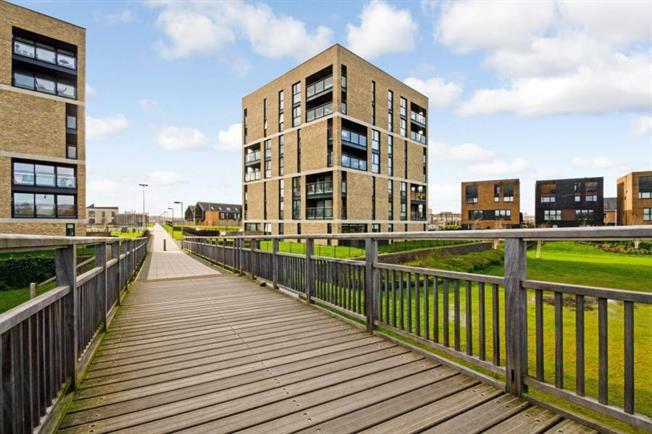 Early viewing is highly recommended for this outstanding 2 bedroom apartment with balcony, on the preferred first floor, forming part of the renowned Athlete's Village situated only three miles East of Glasgow City Centre. Properties of this type are rare to grace the open market and presents a wonderful opportunity for the discerning buyer looking for something special and innovative within a fabulous location close to world-class sporting facilities and excellent transport and road links. Number 95 London Avenue sits on an attractive plot within the village. Internally, the property is offered for sale in first class order and benefits from many notable features such as tasteful dcor, contemporary sanitary ware with attractive tiling and fixtures, highly efficient Nordan double glazing and a system of gas fired central heating. The accommodation comprises: Security entry to the communal hallway with lift and stair access to all floors. Entrance hall. Open plan lounge / dining / kitchen, dual aspect, also with access to balcony. 2 bedrooms (master with en-suite shower room). Bathroom. Externally, the property has residents parking and communal garden grounds. London Avenue is well situated for local shopping which can be found at nearby Rutherglen Main Street, Parkhead Forge and Retail Park. There is also a 24 hour Tesco within walking distance of the property as well as the Clyde Walkway and Cuningar Loop Woodland Park. Schooling at both primary and secondary levels is available locally as well as the new school under construction within the new phase of the development and there are excellent road and public transport links close by including the refurbished Dalmarnock railway station allowing easy access to the City Centre and surrounding areas.